Part of the Cisco Small Business Pro Series, the Cisco SPA 504G offers enough features to be used by executives, office workers and as an entry level unit. Great business features including: speakerphone, redial, call transfer, conferencing, paging, intercom, volume control, message-waiting and voicemail indicator lights, mute key, headset use, and call history directories. 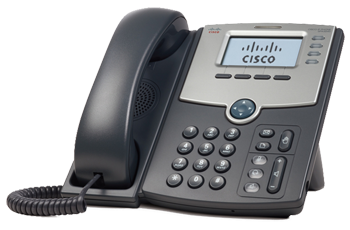 The 504G integrate easily with the Cisco Smart Business Communications System, and your Cisco network can automatically recognise the Cisco SPA504G when is is plugged into your network, eliminating the cost and complexity of adding or moving phones. Reasonably priced full featured phone for the mid Cisco small business user.